WASHINGTON (CNS) — A few years ago, I asked a Salvadoran priest whether he believed Archbishop Oscar Arnulfo Romero, the best known of the martyrs of El Salvador, would ever be recognized by the Catholic Church as a saint. 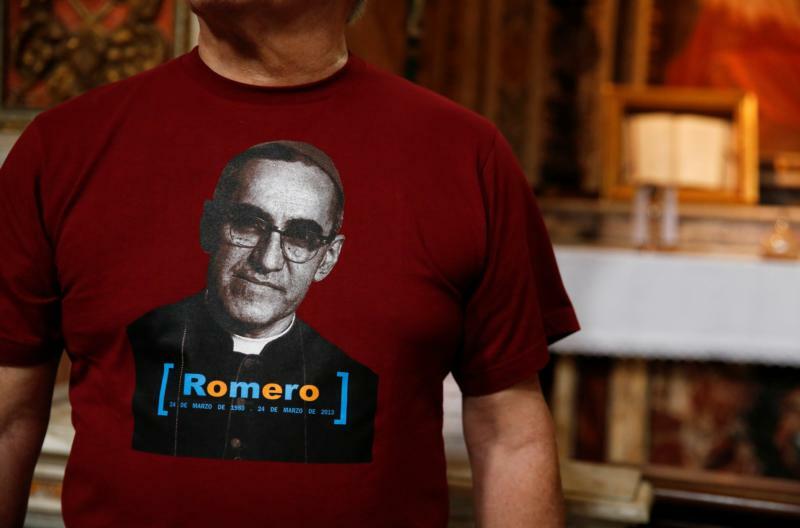 He didn’t hesitate in answering and said he believed it would happen but it might take “a long, long time,” perhaps until Archbishop Romero was “decaffeinated,” meaning that what he stood for during a turbulent time in the history of El Salvador had been stripped away. For years, outright lies — that he was political, that he was a “guerillero,” a guerilla fighter and an instigator — were promulgated in El Salvador and crossed the oceans to the halls of the Vatican, where church officials received “kilos of letters against him,” as Italian Archbishop Vincenzo Paglia, head of Blessed Romero’s cause for sainthood, said in 2015. But the kilos of lies did not outweigh the truth and a history that has overwhelmingly shown that Blessed Romero was a man of peace, a friend of the marginalized, and lived and died like many of his people, a victim of forces that for centuries have enslaved El Salvador’s poor. His name is one in a sea of more than 70,000 innocent Salvadoran brothers and sisters, children, parents, grandparents, aunts and uncles violently killed during 12 years of conflict, and he lost his life simply by living like the unprotected masses. The way he lived, not his death, is what endeared him to thousands of Salvadorans and other Latin Americans who long have called him “St. Romero of the Americas.” He sought no special protection from the daily violence that the majority of the country lived under and chose not to shield himself and his conscience from the country’s struggles. Instead, he fed the poor who picked the coffee crops for miserly wages and strolled through impoverished neighborhoods with a comforting smile while calling on the country’s oppressors to a path of justice, equality and peace. For many of us Salvadorans who were too young to make sense of his killing when it took place on March 24, 1980, his Oct. 14 declaration of sainthood is an official confirmation by the church of the holiness our elders, priests, men and women religious, and lay people who knew him in life, told us about over the years. There’s no shortage of lies that the peddlers of injustice still try to promote, but they have failed to eclipse Romero’s true message of love and closeness with the poor that many in the church in El Salvador have followed and transmitted. To mark his sainthood, the Jesuit-run Catholic Church of the Sacred Heart in Edinburgh, Scotland, is set to dedicate a shrine to him. He is being remembered at Masses throughout the United States, from Washington to San Francisco, in Australia, Cuba and much, if not all, of Latin America, a region that has long thought of him as a saint. Officials from the Archdiocese of San Salvador say they have registered 10,000 Salvadorans to attend the ceremony at the Vatican that will declare him and six others, including his friend and mentor Blessed Paul VI, models for the church. Of those, 3,000 will attend from El Salvador, 2,000 from various parts of the world, and 5,000 Salvadorans living in Italy. Witnessing that brief moment in time, for many of us, is about sharing one of our own, and one of our best, with the world. He showed us that our mission is following a Gospel that calls us to peace, toward happiness and fulfillment by sharing and caring and talking and writing to make life better for the most afflicted of our brothers and sisters in society — no matter what the cost. It’s no small legacy and one that many Salvadorans, inside and outside the country, take seriously. “Each of you who believe must become a microphone, a radio station, a loudspeaker, not to talk, but to call for faith,” he said in a homily on Oct. 29, 1978. Almost 40 years after he said those words, the prophetic voice many of us grew up hearing is no longer just ours, and best of all, it has not been “decaffeinated.” The declaration of Blessed Romero’s sainthood shows us that truth doesn’t merely survive the most vicious and violent attacks by forces such as money and power, but ultimately triumphs.